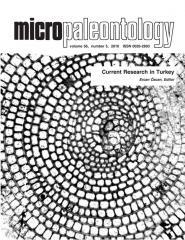 ABSTRACT: Distribution of the benthic foraminiferal assemblages on the continental shelf of the northernMarmara Sea (NWTurkey), controlled by various hydrographic characteristics between Black and Aegean seas, was systematically examined in 26 sediment samples. The samples generally consist of mud, sand and gravel. A total of 115 foraminiferal species belonging to 37 families and 70 genera were determined. Four benthic foraminiferal assemblages occur on the shelf and are characterized by moderate diversity and richness. The assemblages are dominated by 4 species, all calcareous hyaline: Asterigerinata mamilla, Elphidium crispum, Cassidulina carinata, and Brizalina spathulata. Q-mode cluster analysis recognized 4 clusters.